﻿ Preparing your greenhouse for winter. When to bring plants inside. Fall is finally here. This is just about the busiest month for those of us that choose to grow tropical orchids where they are not supposed to grow. Instead of worrying about too much heat it is time to prepare for too much cold. Given the high cost of fuel this year makes it even more important to get preparations started. Inspect your growing area to be sure your glazing is intact; no new cracks, spaces, etc. All of the heating and cooling inherent in greenhouses causes some shifting over seasons and years. Strong winds can have the same effect. Insulation often separates from surfaces in places with high humidity and constant exposure to water. Some of these problems can be easily solved with a tube of good silicone caulking. A can of “Good Stuff”, or one of the other expandable foams available, can also be useful in joints or spaces below the glazing where cold air creeps in. Most of these types of product work better if the application surface is dry. Heaters should be inspected and checked. If you are experienced you can do this yourself, but most hobbyists are better advised to get your gas company to do the inspection and light the burners. They are more skilled at finding problems. Do not forget to check exhaust ducting and vents. They, too, can move during the summer and leak exhaust fumes into the growing space endangering people and orchids. Do this before the first really cold weather arrives to avoid the rush. Get your gas or oil tank filled and prepare for a shock when the bill comes. Even more reason to seal all of the cracks in the greenhouse. Many indoor growers have placed their orchids outside under trees or other shaded areas. It is time to prepare to bring them inside. Carefully inspect plants for insects and other pests. A fine jet of water can clean leaves and bulbs exposing problem pests. Slugs, snails, roaches and many other undesirables love the insides of pots. They may quickly disperse around your home once pots are brought inside. Treat now with appropriate drenches or pesticides. Also, inspect for other orchid pests, such as scale insects. Treat before bringing plants inside for the winter where plants will be crowded allowing pests to spread from plant to plant. Greenhouse growers are wise to follow the same process because it is always easier treating a greenhouse when it can be easily vented. This is also a good time to review what each type of orchid requires for best growth and flowering. Phalaenopsis require a week or two of cool temperatures to initiate spiking. Night temperatures 60-65 F for a week to 10 days are ideal. A few nights in the upper 50s will do no harm as long as the day temperatures warm into the 80s. Once either gloomy weather or night temperatures below 55 arrive, it is time to move both phalaenopsis and vandas inside. Cattleyas generally love cool nights and warm days and can be left outside until night temperatures fall below 50 F. Blue vandas and ascocendas have a good dose of V coerulea in their background and are the exception to the admonition above. They appreciate cool nights and will produce better colored flowers if given cool nights for as long as you can. 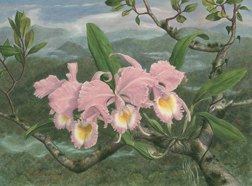 Antelope- and phalaenopsis-type dendrobiums are generally treated like cattleyas, although different growers have different threshold levels. Paphiopetalums are a real mixed bag with respect to temperature. For years several species and their hybrids, notably P rothchildiana, were supposed to require cool nights. These do well for me growing alongside my phals and get only a week or so of cool nights each year. In general though, paphs can handle cooler nights all year long with no harm. Some orchids tolerate and even need cooler temperatures. Zygopetalums will not spike unless they get some cool weather, typically in the low 50s or upper 40s. The most cold-tolerant group is cymbidiums. Some hobbyists claim they get the best blooms only when they leave their cymbidiums outside until they get a light frost. Bright light and cool nights will provide an abundance of blooms later in the winter for this group. It is important to move them into a place where their spikes can grow and not move them continually. Not only can buds or spikes break, but often buds will blast (drop) if growing conditions are changed too dramatically once buds emerge. There are many other orchid groups and even orchids within these groups that have specific requirements that are different. Cattleya violacea and C chocoensis do not like any cool weather. Many bulbophyllums and dendrochilums also come from climates where they seldom experience any cold weather. Species are generally more temperamental than hybrids, which makes them more of a challenge to grow.